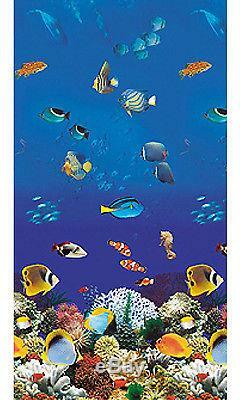 24'x52 Round Beaded Caribbean Above Ground Swimming Pool Liner-25 Gauge. The Caribbean beaded pattern gives a delightful depiction of exotic fish swimming around your pool.. Save More On Pool Supplies have the strongest, most durable, American-made pool liners and the largest variety of patterns for all styles of pools. We offer top quality liners at the Guaranteed Lowest Price! 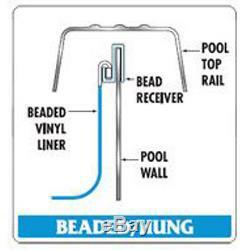 Beaded Connection - Also known as "Hung" Liners. Beaded Liners simplify Liner replacement. Liner snaps into a beaded receiver track. No disassembly of pool required. Great for assuring proper Liner alignment. Extra heavy Duty, 100% virgin vinyl material Protected against chemicals and UV fading Best cold crack resistance in the industry. High temperature curing, computer controlled process insures that 100% of the material is "Vulcanized" to the highest possible tolerances. The most technically advanced radio frequency vinyl welding reduces the chance of cold spots in the seaming process. Hand folded flat, to reduce wrinkles unliked automated packers that twist and force the liner into the box which can cause permanent creasing. Most Common Type of Liners. Beaded: Also known as "Hung" Liners. Perfect for pools with wall heights of 48"-52". Please make sure you measure your swimming pool twice before purchasing. Lastly, none of our liners will fit Intex or any soft-sided swimming pool. The item "24'x52 Round Beaded Caribbean Above Ground Swimming Pool Liner-25 Gauge" is in sale since Monday, March 14, 2016.